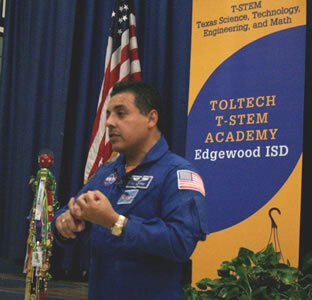 (Jan. 19, 2012) -- Students at Memorial High School in the Edgewood ISD were flying high Jan. 18 when they met with Jose Hernandez and learned about the career choices that landed him a seat on a mission to the International Space Station. During the visit, made possible by a partnership between Edgewood ISD and the UTSA Academy for Teacher Excellence, Hernandez encouraged the students to work hard in school and consider science, technology, engineering, mathematics and related careers. Born Aug. 7, 1962, Hernandez is one of four children of a migrant farming family from Mexico. He learned to speak English at age 12, and while in high school, he participated in Upward Bound, a federal college preparedness program. While majoring in electrical engineering at the University of the Pacific, he participated in the Mathematics, Engineering, Science Achievement (MESA) program, an academic program that supports students from educationally disadvantaged backgrounds while they pursue their four-year degrees. He holds a master's degree in electrical and computer engineering from UC Santa Barbara. In 2001, Hernandez joined Johnson Space Center in Houston, Texas, as an engineer in the Materials and Processes branch before NASA selected him in 2004 for Astronaut Candidate Training. By February 2006, he completed NASA astronaut training, and in fall 2009 was a crewmember of the STS-128 Discovery, NASA's 128th shuttle mission and its 30th mission to the International Space Station. Hernandez visited with students from Edgewood's Memorial High School and Toltech T-STEM Academy. The program, a school-within-a-school project, encourages high school students to pursue careers in science, technology, engineering, mathematics and related fields by offering additional STEM instruction and giving them the opportunity to earn college credits before graduating from high school. The UTSA Academy for Teacher Excellence, which supports the FIPSE-iCLASS program at Memorial High School and its Toltech T-STEM Academy, was established as a hub for school districts, community colleges and UTSA to collaboratively research, design, implement and evaluate educational programs that address emerging, local and statewide educational issues associated with a growing diverse student population. The academy is a critical element of the UTSA College of Education and Human Development teacher education programs and has helped UTSA achieve national recognition as a leader in preparing teachers to teach in culturally diverse settings.